A shadow box is a wonderful way to display the many three-dimensional mementos that come with military service. From uniforms to medals, these items tell the important story about an honorable part of your own or your family's past. All it takes is a little creativity and some time to give them the presentation they deserve. The shape and size of your shadow box will vary, depending on the branch of service and the items you want to include. You can purchase and modify a ready-made shadow box from your local craft store to create the ideal display for your items. Honor a friend or family member who has served his or her country by creating a custom shadow box as a gift. You can include medals, photographs, weapons, portions of a uniform, dog tags, and other important mementos. One great idea is to use a map of the area where the veteran served as a background for the shadow box. You can line the back of the box with this map and then mount the other items in front of it. This offers a layered look and gives an important sense of place to this display. Military service is an important tradition in many families, with several family members serving in one or more branches. You can honor this family custom by showcasing the items belonging to multiple people. The key is to make sure each family member has his or her own section in the display. Purchase a long shadow box for this project and cut smaller pieces of wood to divide it into sections. Use wood glue to attach the dividers to the frame of the existing box. In each section, showcase a photograph of the family member. Below or around the photo, add medals, patches, and other important items. Some families have service members in multiple branches of the military. If this applies to your family, use the member's insignia and a photograph to differentiate each section. For an added touch, print the motto of each military branch and add it to that section of the shadow box. 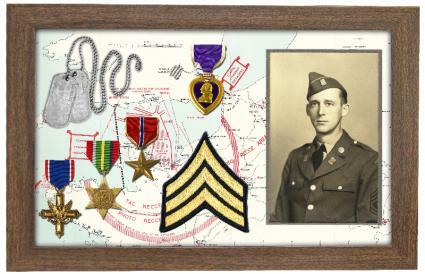 Medals are a very important part of any military shadow box, and you can make them the focal point of your display. Depending on the number of medals you include, the box itself may be small or medium in size. This makes it easy to display the finished box on any wall or surface in your home. One great layout idea for this type of shadow box is to use a photograph to anchor the display and add a personal touch. Then display the medals in rows on either side of the photograph. Keep the background very simple, using black or navy blue fabric to help the medals really stand out. A dress uniform is one of the most iconic mementos of military service, and it's a great item to display in a shadow box. To prevent the uniform from fading while it's displayed use UV-protective film, such as GAM UV Sheets, behind the glass in your case. For this type of display, lay out the uniform as you'd like to display it. Then measure the size of the display and purchase your case accordingly. For a smaller display, you can fold the uniform jacket in half lengthwise. This allows you to showcase the piece without taking up too much room. Including a photograph of the service member in his or her uniform adds a personal dimension to this type of display. If part of your family history includes military service, you can preserve and display mementos and photographs in a shadow box. This makes a great focal point at family reunions or above the desk of a genealogist. Start by gathering the items you'd like to display. This may include photographs, letters, maps, journals, enlistment and discharge papers, weapons, medals, portions of uniforms, and other items. Choose a central item, such as a photograph of your ancestor in uniform, and then surround that with the other pieces you are including. For a background, select something that highlights the age of these items. A sepia brown fabric is a good choice. 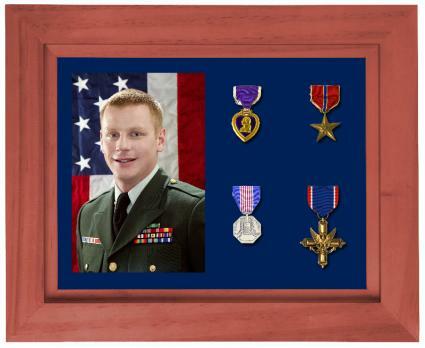 A shadow box is a touching way to honor the memory and sacrifice of a fallen soldier. The centerpiece of this type of box could be the flag presented at the service member's funeral or memorial service. Also include photographs, medals, and other important mementos. You can create a separate section of the case to hold a folded flag. Simply choose a small piece of wood that is similar in species and color to the purchased box. Then use a miter box to cut the ends of the piece at 45-degree angles and attach it with wood glue. Display the flag in the triangular section and the other memorabilia next to it. Whether you're making a shadow box for your military family history or want to preserve and display the mementos of someone currently serving, letters home can be a creative theme. To do this, purchase a small, deep shadow box. Go through the letters to find a few important phrases and use a scanner and printer to enlarge those parts of the letters. Print them out and paste them to the back of the box, overlapping the edges to create a background. Tie the letters in bundles with colored ribbon and lean them up against the back of the box. If possible, include a photograph of the person writing, as well as a pen or pencil. Pick a focus for your box. It's easy to place a bunch of items in the display, but if you choose something special as the focal point, the result will be more powerful. Consider a photograph, a uniform, a medal, or another important element. Edit your selection of items. Military service comes with a lot of mementos, and you can't include them all without overwhelming the person viewing the display. Choose only the essential elements. Select a background that contrasts with the items you're displaying or that complements your theme. The background can recede from view and cause the displayed items to really pop, or it can become part of the display itself. If you'll be hanging the shadow box in an area that gets lots of natural light, consider UV protective film for the glass. Sunlight can be very damaging to paper, photographs, and textiles. Similarly, consider using photo-safe and acid-free supplies when making your shadow box. These materials are designed so they don't introduce chemicals that can damage special items. 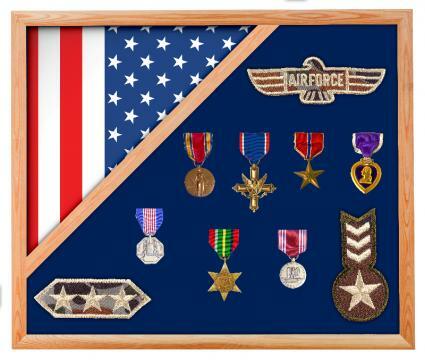 No matter what theme or focus you choose for your military shadow box, this is an excellent way to honor someone who has served his or her country. It's also a great method for preserving and displaying important mementos of this service.